The ancient town of Almora, situated at an altitude of 1638 meters, was the ancient capital of Kumaon founded Katyuri king Raja Balo Kalyan Chand of Chand dynasty in 1563 A.D, then known as Rajapur. The place finds mention in the ancient texts of ‘Skanda Puran’ and referred to as a ‘sacred mountain situated between the two rivers ‘Kaushika’ (modern day Kosi) and ‘Shalmali’ (modern day Suyal). Four hills surround the Almora and are known as Banari Devi, Kasar Devi, Syahi Devi & Katarmal, which also house the well known temples that go by the same names. The town of Almora is situated over a horse saddle shaped ridge of a mountain. The eastern portion of the ridge is known as Talifat and the western one is known as Selifat. The market is at the top of the ridge where these two, Talifat and Selifat jointly terminate. The area is replete with a plethora of temples dating back to the ancient times. We had started from Pithoragarh early, as we had done in Munshiyari and ordered the local staff of KMVN to pack us some ‘Aloo Paranthas’, but I found the staff was rather un-cooperative, lazy and greedy, maybe the effects of a big town living has got to them. As stop over at Pithoragarh was only an overnight affair, after having visited Chandak, which is placed on top of one of the hills surrounding Pithoragarh valley, we moved downwards for the descent from Pithoragarh. After bye-passing the Taxi & Bus stands, the gradual descent took us past a small village called Gurna, situated about 17 kms. from Pithoragarh. After traveling further 17 more kilometers, we crossed the bridge over Saryu river and reached Ghat, where the road bifurcates towards Lohaghat (in Champawat district) and Pannar. We headed towards Pannar, which is situated further at a distance of 8 kms. and the road from here again bifurcates, one leading towards Gangolihat and other towards Dhayari. The road which is a single lane from Pithoragarh till Danya, gradually gets worse from Ghat onwards and as we crossed Pannar, it had become treacherous. The road surface, due to apparent years of neglect, had totally been eroded of its carpeting and it was not only badly pot-holed, but due to the rains, had also been washed away in small stretches. Having passed by Pannar, we reached Dhyari after negotiating such treacherous road conditions for about 15 Kms. The driver had got fatigued and we took a break from the drudgery of such journey in this little nondescript village, to have some cold drinks, however, here too the driver had to make additional efforts to maneuver the car to one side of the road, so that vehicles could pass by along this narrow stretch. Having refreshed ourselves, we headed for the next village Danya, which was placed another 12 kms. ahead and the road stretch here got even worst and was a total nightmare. After having crossed Danya, the road conditions eased tremendously and stayed good till we reached Almora. From Danya we went past Kaflikhan, another 8 kms. ahead, then went past Suakhan, situated further 8 kms. ahead and then reached Artola village, having traversed further 8 Kms. From Artola the road bifurcates towards Jageshwar. The route I have described above is an arterial road connecting upto Dharchula & beyond through Pithoragarh and is the regular route taken by the ‘Kailash Mansarovar Pilgrims’, I cannot fathom the reasons for the state of such poorly maintained road conditions, albeit the fact that it is a strategically important road for India as well. We headed for Jageshwar from Artola and reached the famed ancient temple dedicated to Lord Shiva. The temple is housed in sanctimonious environment, surrounded by huge Deodar trees and is considered to be one of the 12 Jyotirlingas in India. The complex houses about 124 small & big temples and the most famous & biggest of them is the Dandeshwar temple, touted to have been built during the 9th-10th Century A.D, by the Katyuri Kings. This temple houses the Swayambhu Linga named ‘Nagesh Darukabane’ and consists of about 14 other small temples. 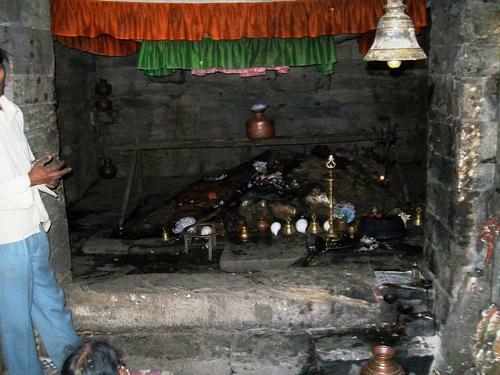 The important idols from the place have been shifted to the Archeological museum, housed in Jageshwar, maintained by the Archeological Survey of India. The serenity & divinity of the place is to be experienced in person and cannot be described in words. However, the sad aspect is that some of the ancient stone idols, akin to Someshwar, have their faces chiseled off, a gift from our historical legacy, read Muslim ruler Aurangzeb, for us. After having visited the magnificent temples of Jageshwar, we headed back to Artola and from there took the road heading towards Almora. We reached Pannaunula after driving for about 5 kms. This place appeared to be a important local destination as the narrow road was full of shops on either side of the road and a lot of local taxis & buses were seen plying through it. We stopped here, to have our lunch and to chomp the ‘Aloo Paranthas’ into our stomachs, I got down in the market to buy some cold drinks, in the process also purchased some very tasty ‘Pakoras’, from the sweet meat shop, by chance. However, having had my Parantha, a strange looking rope caught my sight, I went ahead and asked the shop-owner about it. I was informed that the rope was made from the local Cannabis plants and being very strong was used to tie the cattle, being a Botany student during my graduation days, I could make out that the rope was made of Hemp. After, taking shot of the rope with my Camera, we proceeded ahead and after traveling for about 9 kms., came upon Bare Chinna village and thereafter, after traveling a further distance of another 17 kms., reached the base of famous Chitai Temple, which itself is housed on a hill top. From ChitaiTemple, Almora is barely 6 kms. and we finally reached Almora. Having been misguided by a local taxi driver, we had to take a detour of about 12 odd kms. and checked into the KMVN run Tourist Rest House at around 4.15 P.M. in the evening. As we were entering the hotel premises, which is situated about 100 metes above the road and has to be accessed though a steep flight of stairs, it had started drizzling and we enjoyed some good Coffee and Pakoras, in the salubrious environs of Almora. As it was drizzling, we decided not to go out for local sight seeing, as the weather in the hills can really turn inclement within a matter of seconds and coupled with this, we were also unaware about the topography of the township. 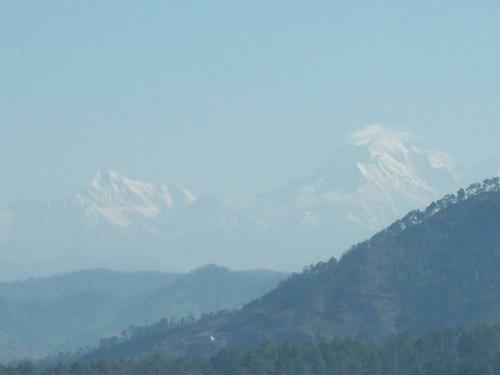 I would just occasionally pop out to view the valley view, as the Himalayan peaks were covered with a shroud of clouds. There is a viewing point at the KMVN, Rest house itself, which depicts the various peaks that can be viewed from there. At around 7.00 P.M the room attendant came and requested to place our dinner orders and also to partake the same by 8.30-9.00 P.M. On enquiring about the stipulation being imposed, we were informed that the second batch of yatris for the ‘Kailash-Mansarovar yatra’ were scheduled for arrival for night halt. On further enquiry, I found out that the yatris start from New Delhi and after partaking lunch at Kaladhungi, TRH reach Almora at night and have a night halt there. They leave early next day after Bed tea, they partake breakfast at Danya, TRH and then head for Pithoragarh, TRH where they have lunch and then head for Dharchula, TRH for night stay. We took our dinner early and the Yatris reached Almora at about 9.30 P.M. where they were allocated rooms and served with hot soup as appetizer. We retired for the night early, oblivious of the cacophony created by the bunch of Yatris. As we were tired, we could not get up early enough to catch a glimpse of theSunrise; it was only after the attendant knocked the door for serving the bed-tea that we woke from our slumber. Having had a refreshing cup of morning tea, I got out to the lawn in front of the rest house and was thrilled to see a clear view of the Himalayan peaks. After shooting a few pictures, I hurried back to my hotel room, to get dressed, so that we could proceed for the famous SunTemple at Katarmal. I alongwith my wife came down to the main road and asked a few local residents for directions to the local taxi stand, as we had been informed that vehicles do not ply upto the temple and one has to keep the vehicle parked by the roadside below. We were also informed by the locals that the stand was about one to one & half kilometers down in the market area. As we embarked upon the stretch, so as to walk down to the market, all of a sudden I heard some car honking its horns behind us. We turned around to find that one of the local gentlemen, whom we had asked for directions, had hailed a taxi for us. After a little bit of negotiations, we bargained for Rs.600/- for the trip and got into the vehicle. The journey was downhill till the Kosi river bridge and thereafter, took a steep uphill left side curve, which was embanked by an array of shops. Due to heavy vehicular movement, there was a jam on the road at this junction and we could move only after a good 15 odd minutes wait. Thereafter, the road moved along the retaining wall of the Govind Ballabh Pant Institute of Himalayan Environment & Development and just after you cross its main gate a narrow bridle path appears, which any outsider would easily miss, from whence the trudge to the famous Sun Temple of Katarmal commences. We were told that only a handful of jeep drivers from Kosi make the trip to a ledge below theTemple precincts and thus, we commenced with our trek. It was quite hot and in our hurry we had forgotten to carry our water bottles and the climb was steep. While climbing on the hills, although the object appears nearer, it is much further than one anticipates. After climbing for about an hour or so, my wife was on verge of giving up the climb and was suggesting me to continue, stating that she would rather wait there, as she was parched for want of water. Suddenly a local villager appeared from nowhere and told us that the Katarmal village was about 100 meters ahead, and that one could get some cold drinks etc. from a shop there. This encouraged her a bit and she continued with the trek, just as she was about to give up again, a small temple with kids running around about 20 meters ahead appeared and I nudged her to reach till the temple gate. As we reached the gate, the village shop came into sight and immediately went ahead a procured some cold drinks, chips & chocolates, as we had started without partaking the morning breakfast. I also purchased some incense sticks etc. for performing Puja at the SunTemple and proceeded through the village, towards the temple complex, which is housed above the Katarmal village (about 600 meters above the village). This trek from the main road till the Templecomplex is about 3 kms. and it took us about 1½ hours to reach it. The Sun temple at Katarmal is a stupendous structure, built in the 9th Century A.D. by Raja Kattarmal of the Katyuri dynasty and is one amongst the fourSunTemples in India, ranked next only to the famed Sun temple of Konark in Orissa. The presiding deity of the temple is referred to locally as the ‘Burha Aditya’ or ‘Vridha Aditya’ (meaning old Sun God). The complex added a number of temples by various rulers over the period of time from 7th Century to 13th Century A.D and at present houses an ensemble of 44 big & small temples. The main temple houses the idols of Shiva Parvati & Laxmi Narayan and a superb idol the Sun God carved in stone. After the 10th Century idol of the presiding deity of the temple was stolen, the hand crafted doorframe & other important artifacts were removed by the ASI and are now housed at theNationalMuseum in New Delhi. The KatarmalSunTemple is placed atop a hill, at an altitude of 2,116 meters, facing eastwards and offers a superb view of the entire Almora township. It is an architectural wonder that is to be seen to be believed. However, while we were preparing to leave the temple complex, my wife suddenly lost balance and hurt the muscle below her knee. Having worked in association of Doctors, I have been able to learn a few rudimentary tricks of their trade. Accordingly, I checked whether she had a fracture or not and upon being assured that all the bones were intact, asked her as to whether she would be able to negotiate till the road head or else we could call a jeep from Kosi. But she insisted that she would trudge back on her own, with my support. Having purchased a bottle of pain killing & anti-inflammatory ayurvedic medication that goes by the brand name of Iodex, I administered a copious amount on the effected portion and started the downward trek. Facing the pain boldly, we walked back to the Car at the roadside in another Hour or so. The driver was astounded to find us back in three hours time and that too with this kind of sprain & cramps. He had spoken to some local villager, who had informed him that it takes them about 50 minutes to trek upto their village and the outsiders usually did the run in about 2 hours or so. The driver had accordingly calculated that we would not be back before 5 odd hours. We sought some good shop shelling out medicines and I called on my friend, who is an orthopedic surgeon back in Delhi and on his advice procured the medicines from a shop in Almora. As we were busy buying medicines, I suddenly received a call on my mobile as it was past 11.00 A.M and the hotel staff was approaching them regarding check-out from the hotel. We reached back at around 11.30 A.M. and packed our remaining luggage and thereafter had out breakfast before heading out from Almora. Due the unfortunate incident, we could not visit the famousChitaiTemple or other spots around Almora and hope to do the rounds on another occasion, another time. © S Roy Biswas., all rights reserved. It's always a pleasure to witness Himalayan range. Almora is a quaint hill station and is blessed with lush greenery, exquisite landscapes and beautiful temples. It's always helpful to plan your stay at best hotels in Almora to have a memorable experience.